My son loves dog that he always play our neighbor's dogs. Hubby and i are planning to get him a dog when he will be ready to take care of it. We do not have dog in our house but we have the two dogs in our farm. Last year we bought a big dog bed but it was never been used since we do not have a dog.At least we have that bed if the dog that we plan to get is here in the house. I know how important for some families to have their dogs in their house. Some people spend so much money just for their dogs. 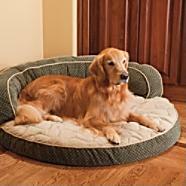 This holiday season why not get your dog a new dog bed that you can find at the link above. You can choose what design or style you want and what color for your dog bed. They offer not only for dog bed but blankets, throws, pillows, and many more. Check them out today.